August 7 - Saint Sixtus II, Pope, and Companions, Martyrs - Optional Memorial - My Catholic Life! The sixth pope was named the “Sixth” or, in Latin, “Sixtus.” He reigned from 115-125 A.D. The next Sixtus was today’s martyr, who reigned from one August to the next in 257 – 258. Sixtus II (or Sixth, the Second) is listed in the Roman Canon’s select roll call of sainted popes: “Linus, Cletus, Clement, Sixtus, Lawrence, Cyprian…” The preservation of his name in the liturgy is compelling proof of the lasting impact of his bloody witness. After the legalization of Christianity in 313, perhaps two popes were martyred, although various others died unnatural deaths. But throughout the 200s, solid historical evidence proves that more than a dozen popes were assassinated by Roman authorities just for being Christian leaders. Many of their remains were interred in an ornate burial chamber in the catacombs of Saint Callixtus, which was excavated in the 1850s. Sixtus II succeeded to the chair of Saint Peter at a difficult time. The on-again, off-again persecutions of the early Church were on-again in the 250s. The Roman Emperors Decius and Valerian sought the blood of Christians not only to try to decapitate the surging Church but also to confiscate the wealth and property of Christians. The tensions in Church-State relations were no less serious than internal Church tensions tearing at its unity. The persecution of Decius from 250-251 was wicked. Decius’ edict required everyone in the empire to sacrifice to a Roman god in the presence of a state official, with a signed libellus, or certificate, being issued afterward as proof. Many Christians were weak and afraid and so sacrificed to gods they knew didn’t exist. Some Christians purchased a libellus, some fled to the safety of the countryside, and some refused to sacrifice and were cruelly martyred. Christians’ divergent responses to the persecution—some heroic, some weak, some uncertain—were traumatic for the Church. Many in the African and Asiatic Church said that those who sacrificed (the lapsi) must be re-baptized. Pope Stephen I, Sixtus II’s predecessor, said that the lapsi must only repent to be reconciled with the Church. The theological positions of the two camps were each sincere, and hardened over time. There was no easy answer. After Stephen died, it seems that Pope Sixtus II was more diplomatic in seeking reconciliation with the African and Asiatic churches over this controversy, although it would not be theologically resolved until Saint Augustine wrote one hundred and fifty years later. Sixtus II had to be consecrated as Pope in secret because of the times. In 257, the formerly peaceable Emperor Valerian issued an anti-Christian edict which forbade Christians from assembling in cemeteries. Sixtus avoided persecution for many months. But in early August 258, Valerian got serious. A new edict focused on essential targets. Bishops, priests, and deacons could be put to death without a trial. On August 6, 258, Pope Sixtus II was with his flock, seated and preaching the word of God, probably at Mass in the catacombs. A small troop of soldiers was on the hunt. The Pope must die. With torches lighting the way, the soldiers scurried through the warren of dark and narrow passageways toward the underground chapel. Perhaps they heard some singing. They acquired their prize soon enough, and the deed was done. Saint Cyprian, bishop of Carthage, North Africa, received the news shortly afterward and, before being martyred himself, wrote a letter to his flock: “Valerian has issued an edict to the Senate to the effect that bishops, presbyters, and deacons shall suffer the death penalty without delay…I must also inform you that Sixtus was put to death in a catacomb on the sixth of August, and four deacons with him…Let all our people fix their minds not on death but rather on immortality…knowing that in this contest the soldiers of God and Christ are not slain but rather win their crowns.” An inscription placed on Sixtus II’s tomb over a hundred years after his death by Pope Damasus, rediscovered in the 1800’s, verifies the drama of Sixtus II’s last moments. It notes that the shepherd gave his life for his flock. The faithful with Sixtus that fateful day walked up the steps of the catacomb into the daylight totally unharmed, while their pastor lay dead. 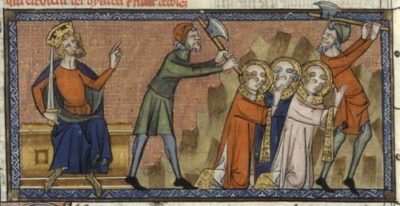 The companions martyred with Sixtus were the deacons Januarius, Vincentius, Magnus, Stephanus, Felicissimus and Agapitus. Pope Saint Sixtus II, you were a servant and a leader, a confident shepherd to a frightened flock, a central actor, not a bystander; a witness to truth, not an outside observer; a light generating others’ shadows. You are known because you were courageous. Make us faithful like you.